How do we acid wash your Las Vegas or Henderson pool? At times your algae growth cannot be eliminated without a proper acid wash. At Las Vegas Pool Service we specialize in performing an acid wash for your pool and eliminating all growth and spores from your plaster or pebble tec. 1. 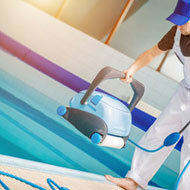 We Are Highly Trained To Do Pool Acid Washes. 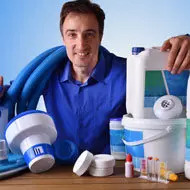 Performing an acid wash properly on a pool needs to be completed by a true professional who knows what he is doing and who will not damage your pool during the process. 2. We Safely Acid Wash Pools Using Proven Methods. 3. Our Acid Wash Process Described In Detail. Perform a liquid chlorine wash which includes brushing all algae and spores to remove all of the algae. This step is very important and cannot be overlooked. 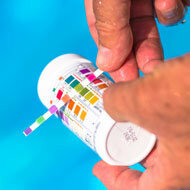 Start the acid wash by having plenty of protective materials for us as well as your pool. Acid is very potent and the fumes are deadly so we use soda ash to neutralize the acid while cleaning. Use lots of water. While we scrub the walls we have a sump pump running at the same time because we are using plenty of water from a garden hose to rinse off the acid as we brush it. It is important that the acid does not stay too long on your pool or you could have permanent damage and rough plaster thereafter. After performing the acid wash we will add the proper amount of conditioner as well as shock so that the PH levels are where they need to be when you are ready to start swimming. We look forward to performing an effective acid wash on your Las Vegas pool and we know that you will be very pleased with the results as well!